As early as 1843 Hugh Jennings was working as a turnkey at the County of Down Gaol at Downpatrick. His name was listed in the report of the Inspectors-General of Prisons &c, Ireland for that year. The University of Southampton Library has digitised a number of these reports covering several decades and Hugh's career may be traced through to his retirement in 1870. 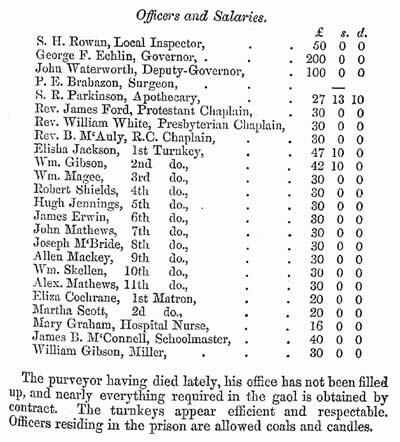 Here is the list of officers at Downpatrick Gaol for 1843 showing that Hugh was 9th Turnkey. I forgot to state, that a prisoner had effected his escape from the gaol; and that as it appeared that one of the Turnkeys had been guilty of culpable neglect in the matter, he was dismissed by the Board, and another appointed in his place. Fortunately Hugh was not involved and by 1852 he had moved up the order of seniority to 5th Turnkey. It seems in the meantime that the salary scales had been revised because the turnkeys were paid less than in 1843, whereas some of the other staff were being paid more, including the 1st and 2nd Turnkeys. I'm sure that went down well. Did the duties change? Was it to bring rates of pay in-line with other parts of Ireland? Perhaps with 11 turnkeys on the strength they were working fewer hours. It is good to know they appeared "efficient and respectable". Possibly the cost of the "coals and candles" explains why their salary had been cut. By 1858 Hugh had moved up to 3rd Turnkey, but still on £30 per annum. He had however taken on the additional title of shoemaker. Whether this was to provide shoes for the inmates or to instruct them in the manufacture of their own shoes is not clear, but Hugh had assistance in the role from another turnkey named Kester Jennings. Were they related perhaps? 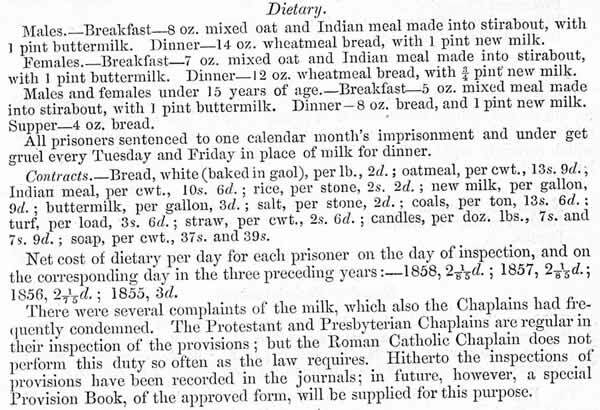 The Report for 1858 contains the following account of the daily menu for prisoners and the cost of providing for them. No mention of meat, just stirabout (porridge) and bread and milk. Only the younger prisoners were given supper. Amongst the contracts it is interesting that there are two prices for candles and soap: one for prisoners and the other for staff presumably. Even poor quality soap was relatively expensive, for example, compared with the price of coal. The net cost of dietary per day in 1858 was slightly less than 1p in modern currency - and the Authorities would have been pleased to see it had fallen since 1855. On the plus side we are also told that the turnkeys are supplied with fire-arms and uniforms. Eventually, by 1864, Hugh was promoted to 2nd Turnkey on the higher salary of £42 10s. Ten pounds more than the standard rate for turnkeys. 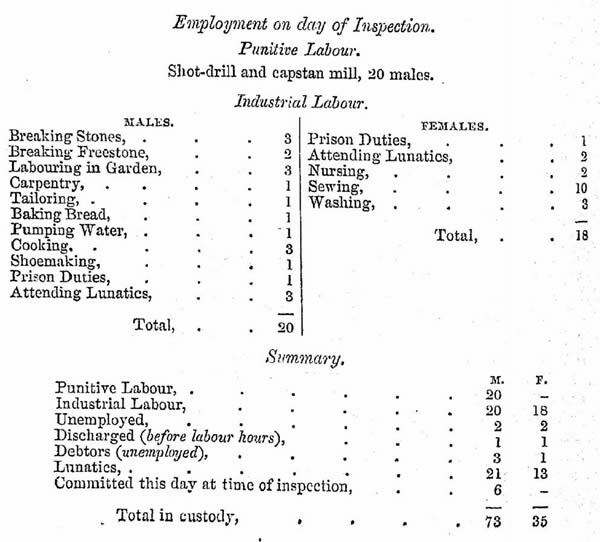 We can see how the prisoners in his charge were employed on a typical day. Shot-drill consisted of passing cannon-balls one to another along a line. The Inspector regretted that there is no treadwheel in this gaol. Prisoners sentenced to hard labour spend two hours each day at shot-drill, and two hours turning a capstan, the power of which is not applied to any purpose, and is therefore lost. I thought that was the point of such activity, that there was no outcome. When Hugh Jennings died, a pensioner, on 27 August 1886 he left £2 14s 8d, and Letters of Administration were granted at Belfast on 22 Dec 1887 to Mary Dixon (Wife of John Dixon) of Downpatrick, the Child.